Dixons Retail pre-tax losses rise to £25.3m | What Hi-Fi? Dixons Retail has posted a pre-tax loss of £25.3m in the first half of its financial year to October 15th 2011, reports ERTonline. This is a substanial increase on the £6.9m loss it recorded a year earlier, but is better than analysts predicted and net debt has been cut from £215.1m to £143.2m. 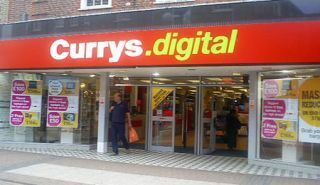 The company, which owns Currys Digital stores, also says it's on track to achieve £60m of cost reductions this year as part of a three-year, £150m cost-cutting programme. In addition, Dixons says it has increased its market share and halved a downturn in like-for-like sales in the UK and Ireland from 10% to 5%. Customer satisfaction levels are also said to be rising.